Cut the French bread in half horizontally, and then in halves lengthwise. 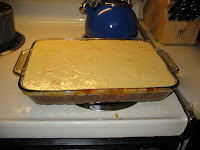 Lay on a baking sheet. Make sauce (or open a jar of pizza sauce - we won't tell!). If you have pesto in the fridge, just mix a couple of tablespoons of that into the tomato and forget the spices. Spread the sauce on the bread. 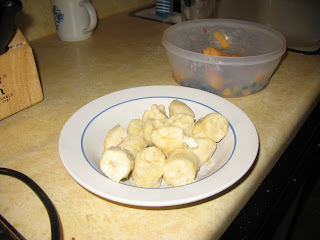 A friend wrote me a note a few days ago and suggested I do some posts on low budget meals. Which I think is a great idea. Except that I don't know what is on sale in your neck of the woods today, or what your neighbor is growing too much of .... so instead perhaps a few tips on how I maximize my food dollars. I'm not promising all of these will work for you, but perhaps a few will. 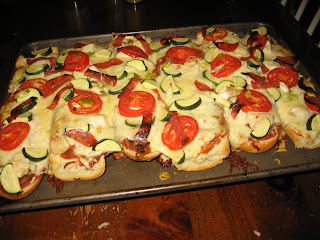 Most of what I make is "budget" food - the french bread pizzas were because I had a coupon for free French bread. All the zucchini recently has been because of gifts of zucchini or zucchini included in my CSA share. Pretty soon there will be a lot of tomato recipes as the vines outside begin to give me ripe fruit. The steak I cooked on the grill was on sale and had a $3 off coupon attached to it beyond the sale price. Chili and other bean based meals are almost always a bargain, as are egg salads or chicken salad when you get the chicken for $2 a pound. Free is always cheaper than any other option. If someone gives you zucchini, peaches or tomatoes that is the cheapest option for dinner tonight. From what I've read, frozen produce is just as healthy as few day old "fresh produce". So especially for food you are going to cook anyway, check the prices on frozen veggies. Bell pepper is a good example - at Trader Joes I get a pound of tri-color pepper strips for far less than a pound of fresh peppers - and the price does not include the seed and stem I would discard from the fresh peppers. What to Eat is a great resource for balancing the health claims from the food industry so you can make informed decisions. After checking it out of my local library multiple times I finally bought a copy. Some fruit, especially, is really easy to freeze. I "put up" about 8 quarts of blueberries a few weeks ago because I found them cheap. I just rinsed them, let them dry for thirty minutes or so, and then put them in plastic containers and stacked them in my freezer. They will make great additions to pancakes, crisps, pies and sauces all winter. When cooking with fruit, I frequently buy "seconds" at my local orchard - when I make applesauce, for instance, I will end up spending only $25 or so on two or three BUSHELS of applesauce by buying the seconds. It might require a little bit of paring on my part, but most of the apple don't even need that. I did the same thing with 16 quarts of strawberries I froze and canned in May. Look for the $2 or $3 off coupons attached to packaged meat when they are getting close to their expiration date. The other day I found 1 pound rolls of hot sausage which were on sale 2 for 4.99 and EACH had a $2 off coupon. Can't beat .50/pound for a sausage brand we really like! I've found similar deals on kielbasa, Italian sausage, bacon, scrapple ... likewise, if you can find a $3 off coupon on a steak that is already on sale, you can eat really well for just a few dollars. Find a few? Put them in your freezer for later. I've had pretty good success buying meat at BJ's. Not as good as the "scores" using the first two methods, but good prices. The ten pound bags of individually frozen chicken breasts are a particularly good deal. They also have good prices on frozen fish. Trader Joes and Aldi each have good, but not great prices on certain things - frozen chicken for both, frozen fish at Trader Joes. This only helps if you live near Philadelphia, but I sometimes stock my freezer at Shady Maple in Lancaster County. 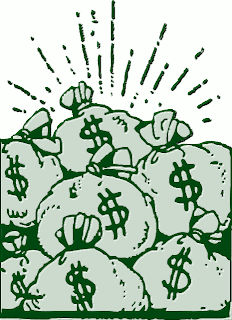 You have to buy in larger quantities, but you can get good prices. Many items I only buy at Aldi: canned beans, chicken broth (when I'm out of frozen stock), canned diced tomatoes, tomato sauce, tomato paste, canned chick peas, flour, sugars, oatmeal, corn bread mix. Other items I buy as they are on sale, and buy a couple for my basement pantry shelves. This is actually a BIG money saver - shopping to stock your pantry from what is least expensive. Then you shop FROM YOUR CABINETS to plan your menu. Want to get your blackbelt in frugal good shopping? Study at the knees of The Tightwad Gazette . Check the price per ounce. Sometimes a sale will make the 10 oz price of "product x" cheap enough that buying the 25 oz "economy size" bottle MORE EXPENSIVE per ounce. Almost every spice I have is from Penzeys. If you don't have one near you, you have to order a few things at a time to make it worth the shipping, but their prices and quality are far superior to the grocery store. If you already have the spice jars, buy the little loose bags and refill them yourself. A few times a year I spend time refilling all my little bottles, and I think it saves me a good bit of money. As an example, a typical jar of basil holds about an ounce. At one of the local grocery stores, they would charge 4.25. But Penzeys has theirs for 2.79/ounce or 6.49/for a 4 ounces bag. Most of the time I stay away from frozen foods, except for the highly unprocessed ones (frozen peas, frozen chicken breasts, frozen green beans). I do, however, have an inherited weakness for ice cream (I blame Grammy). So for that I stay flexible on brand. If Edy's is on a good sale we're eating that this month. Or Turkey Hill. Or Breyers. It's also an item on which I practice portion control - I can get far more servings at a half cup at a time than if I eat it in cereal bowl quantities. Certain foods are expensive enough that I only tend to buy them if we have eating out money in the budget - for instance, if I pick up steamed crab legs and a baguette, it is a ready to eat special treat for under $20, but feels a bit more "special" than take-out pizza. I think one of the biggest ways to save money on groceries is to NOT THROW THEM OUT. To do this, I have to pay attention to what I have on hand, and do my best to use them up. Epicurious (the website for Bon Appetit and Gourmet magazines) has a really useful advanced search, so if you have two onions, one pepper and some roast beef to use up, you enter those and it suggests options. When I have a slightly squishy banana I freeze it for a future banana bread. Most other fruits, if slightly mushy (peaches, apples, berries, peaches) get turned into a not-too-sweet crisp, which we then eat with ice cream for dessert and for a few breakfasts thereafter. Most leftover veggies and meat can be used in one of these: fried rice, omelets, frittatas, quiche, or soup. NOTE: In all of this I am NOT advocating eating food past the point of food safety. I'm only talking about when you can't stand a third day of ____ or a piece of fruit is no longer cosmetically pretty (but would be fine with a little paring). But I suppose I have not really answered the question. What would I cook if I had no pre-purchased food which had been obtained from previous sales and a very tight grocery budget? I would buy bone-in, skin-on chicken and cut it myself - it is almost always cheaper. I would depend on store brand frozen vegetables (mixed, green beans, broccoli, peas), inexpensive local produce, and the fresh vegetables that are almost always cheap: cabbage, carrots, onions, potatoes. When it comes to deciding whether to make something myself, I always try to figure out if I can make it significantly cheaper, tastier or healthier by making it myself. For some things I can not accomplish any of these goals. So, for instance, I have never attempted to make a cheese danish because for the once or twice per year I purchase them at the Entemanns outlet, I wouldn't be able to make it cheaper. It's already pretty tasty, and regardless of the kitchen which produces a cheese danish, it is never going to be healthy. First - buy them only when they look very fresh - they should feel heavy for their size (not dried up), and look like leaves that would still be on the tree - not those you'd find on the ground in November. Rinse them well, and chop the hardened end off the stem. I like to cook mine by steaming. 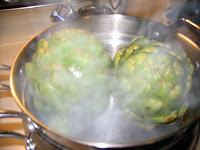 I do this in one of two ways - either I put small to medium size artichokes in my 8 cup glass measuring cup, add some water at the bottom and cover with a plate before microwaving about twenty minutes at a low power. Or, I put them in my steamer pot. The ones I had tonight were HUGE, so I cooked them about forty-five minutes. 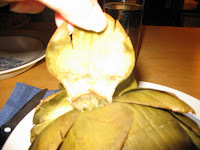 They are finished when a leaf EASILY pulls free from the artichoke. Serve on a plate or in a shallow bowl, with another dish available for all the trash. (only eating ribs or cracking crabs produces as much waste). 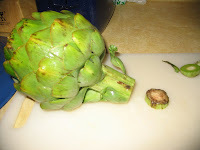 Pull a leaf off the artichoke. Dip the end that was attached into butter if desired. 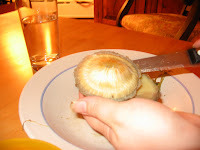 Flip the leaf over so the inside is facing down, and then scrape the bottom half of the leaf with your teeth. Repeat about 76 times, until all the big leaves are finished. When you get down to little tiny leaves you can generally lift them off all together. Now use a knife to cut away the "choke" ... there is a reason they call it that. You don't want to eat all those little hairs. 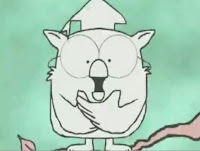 Once the choke is removed you have a lovely heart - the reward in the center of the tootsie pop! Peel, pit and chop peaches. (don't worry about the size - I had pieces from marble to golf ball size). Add the blueberries (washed, of course). Stir in the vanilla and cinnamon and pour into an 8 inch square pan. Melt butter in the microwave. Stir in brown sugar and a tsp of salt. 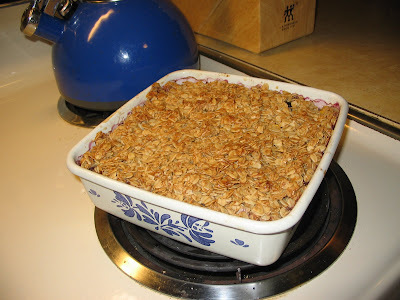 Mix in oats, and spread over fruit. Bake at 350 for about 40 minutes. Serve with vanilla ice cream. Note that this is NOT a very sweet dessert. 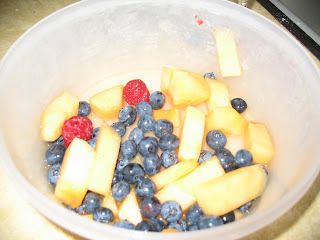 I actually like the leftovers for breakfast - lots of fruit and oatmeal. If your family is accustomed to sweeter dishes, you might want to double the sugar. I was making French Toast the other day, and wanted to add a sprinkling of powdered sugar for presentation. 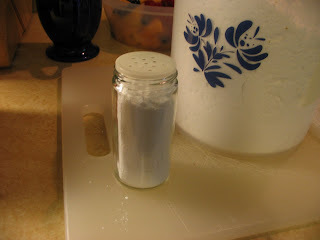 I don't know why I never thought of this before, but I realised I had an empty sprinkle top spice bottle in my drawer .... so I filled it with powdered sugar. It is now much easier to add a touch of white to the top of a sweet dish! I love to cook breakfast food. 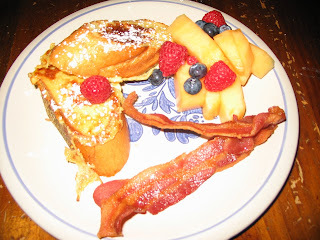 Even more I love to eat breakfast food. But given that I work a regular 8-5 type job, weekday breakfasts tend to be a high-fiber english muffin or something equally mundane. Heat skillet to medium-high. Add butter or oil to pan. Beat eggs and milk, plus some nutmeg (preferably freshly ground) and some vanilla extract. 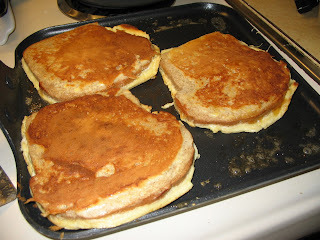 Dip the bread in the egg mixture and place on skillet. When lightly browned on the bottom side, flip and continue. Cook the bacon in the microwave, and then serve all the yumminess on a plate with big cups of coffee to welcom the dawn (or more likely, the noon hour). I'm not super political about my food. But I certainly recognize the desirability of local food based on freshness, taste, and cost. So how to find good local produce? Drive down rural highways and stop at farm stands. Make friends with someone who grows zucchini and tomatoes. Visit your local pick-your-own orchard. 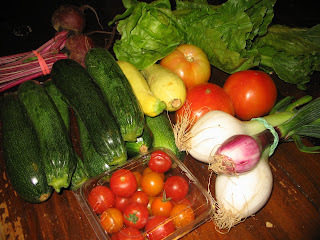 If you live in the Western suburbs of Philadelphia like I do, check out my links to the right - Gentiles, Linvilla, Boothscorner Farmers Market, Ardmore Farmers Market, and Wolffs are all wonderful. Reading Terminal Market and the stands at the Italian Market are great if you live in Philadelphia. 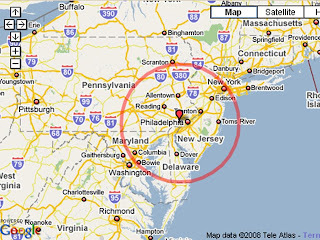 Farm to City also lists Farmers Markets in the general Philly area. That means I have New Jersey Sweet Corn, blueberries, tomatoes; produce, dairy and even chicken from Lancaster, BLUE CRABS from Maryland .... not bad at all! A whole meal, cooked on the grill! I've been thinking for a couple of weeks about if it was possible to do an entire meal on the grill. Not a grilled veggie kabobs and grilled chicken type meal, because of course that can be done. I was thinking of a more complete meal - one where I would normally use my oven. 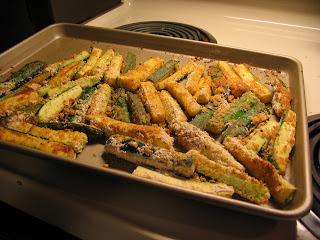 As I posted a few days ago, I simply LOVE zucchini fries now. But with temperatures in the upper 90's today, I did NOT want to turn on my oven. So I decided to try "baking" them on the grill. My grill has three burners - so I lighted it up, and turned the left and right ones down to low grill, and turned the middle burned off. I have a thermostat on the front of the grill, so I was hoping for approximately 400 degrees. 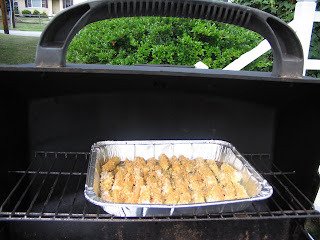 Meanwhile I prepped the zucchini - cut it into match sticks, dipped it in a beaten egg (which turned out just as well as the whipped egg white - so don't bother with the beaters), and then in the mixture of panko crumbs, flour and spices. These went into a greased disposable aluminum pan. 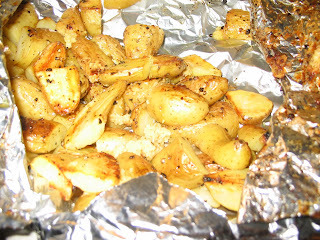 Onto the top shelf of the grill they went, and I left them there to cook for about forty five minutes. Meanwhile, I decided the rest of the menu would be potatoes, steak, salad and strawberry shortcake. 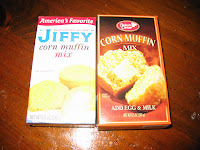 Mix these together, and then add milk until it is a thick dough consistency. 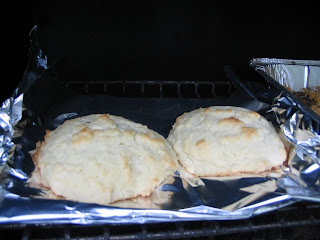 I then spooned the batter onto a sheet of aluminum foil, and put them on the grill. They probably cooked 30 minutes total. 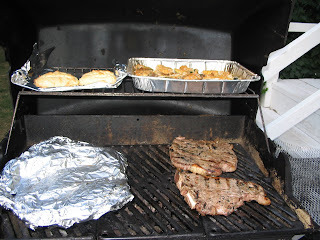 I turned the right side of the grill up to high, and went back in to prep the steaks. I normally use a rub from Penzeys called "Chicago Steak Seasoning". I cooked the steaks about three minutes per side, and then took it all off the grill. It worked great! As we continue our heat wave here in Philadelphia, here is another don't-heat-up-the-kitchen idea, which is also great for an elegant picnic. Pate is also a wonderful addition. Or smoked salmon and cream cheese. 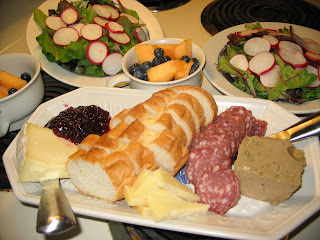 My tray yesterday included Saint Andre Cheese, Ligonberry jam, mushroom liver pate, chianti salami, baguette, and parrano. I served with a fruit salad of cantelope and blueberries, and a separate salad of mixed greens, thousand island and thin slices of radish. You can also make a larger version of this for a party - and it doesn't take much effort right before the guests arrive, which is more than can be said for most appetizers. We're having a heat wave here in Philly. Sometimes a big meal just is NOT what you want when it is hot, especially if you are also packing and moving boxes, as we are this weekend. So this is just a little public service announcement, in case you too tend to forget about the wonder of fruit smoothies. 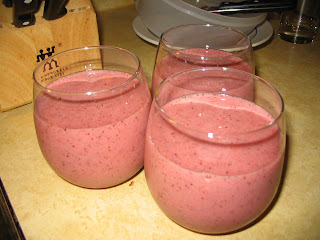 ... blend all together and pour into glasses! Place eggs in a medium size pot, and fill with cold water. Cover and place on burner on medium. Bring up to boil, and then turn the burner off. Do not uncover, do no remove from burner. After an hour or more, drain the eggs and run cold water until they are cool to the touch. Peel and roughly chop eggs. Add mayo and mustard, and mix until the egg yolks are no longer visible as little bits. This made three lunch servings of egg salad. 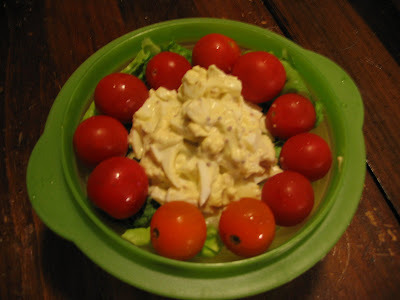 I served on a bed of lettuce (mixture of romaine and butter lettuce this week), with baby tomatoes. 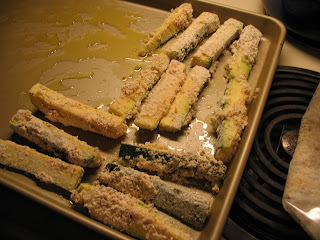 4 large zucchini, cut in half and then in small strips - about pencil thickness. Preheat oven to 450. Grease a large cookie pan (I brushed mine with olive oil). 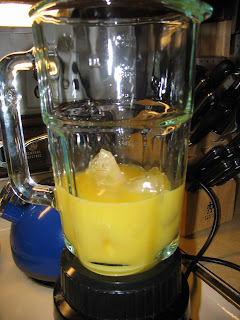 Beat the egg whites in a mixer to stiff peaks stage. I have to say these turned out VERY good. Fairly low fat, but yet very tasty. We had them as a side dish with cheeseburgers. Heat oven to 375. 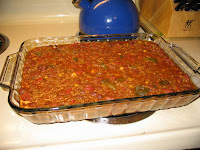 Scoop chili (preferably from the day before - it actually tastes better the next day) into 13 x 9 pan. Heat in oven for about 30 minutes. Combine cornbread mix, eggs and milk and pour over cheese. Return to oven. 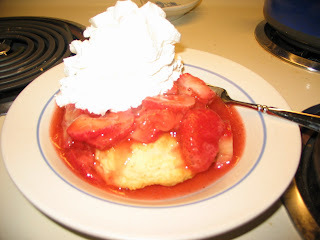 Start at about 25 minutes, then watch it until the cornbread top looks finished. Combine all the ingredients in crockpot, and cook on low 6-8 hours. Serve with shredded cheddar, topped with sour cream, and possibly salsa. 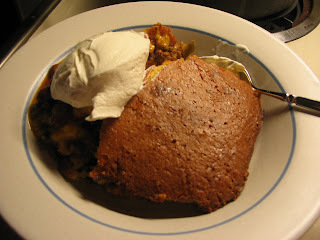 I served this round with a simple corn pone - but it didn't turn out as well as I hoped, so I won't bother sharing the recipe. 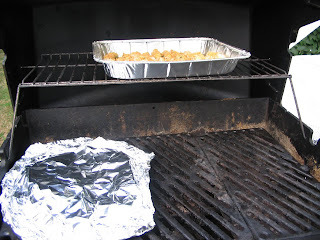 Corn chips or french bread are also good foils. A salad would be a nice side dish. 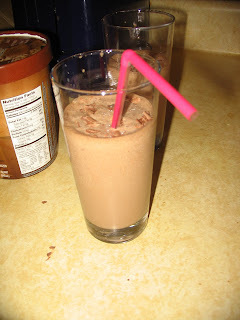 Blend coffee, cocoa powder and ice until cocoa powder is completely mixed in. 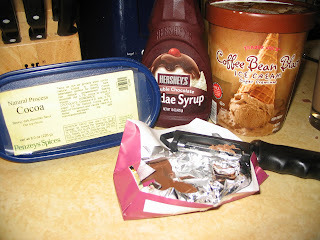 Add the chocolate syrup, ice cream and chocolate bar, and blend again. Split between two glasses, and, if you're feeling fancy, garnish with chocolate shavings (run a potato peeler down the side of a chocolate bar). Apple Dumplings - these look pretty easy, too! I think this is officially a "deep dish" pie, because I only put a top crust on it. But this would actually be a "shallow dish" pie if there was such a thing - it probably is only enough for four people. Because I have yet to remaster the art of making pie dough (I could in my teens, but lost the touch), and I only had one roll out pie dough in my refrigerator. Mix the sugar into the berries and pour into a pretty tart pan. 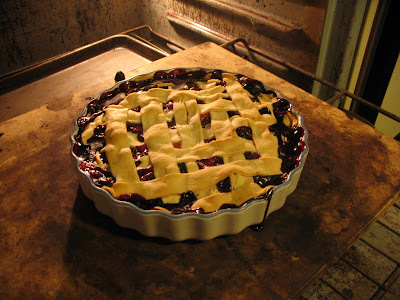 Top with pie crust - I cut mine into long strips and made a lazy man's lattice. Bake at 425 for about 20 minutes, then turn down to 350 and bake another 30 - until the juices are nice and bubbly and the crust is starting to brown. It was actually only supposed to include 4 zucchini, but there is a "trade" box, so if you don't like something you can trade for a different vegetable. I didn't think the cucumbers look too great, so I traded mine for zucchini. I combined all of the ingredients except the cheese and bread crumbs, poured it into a 13 x 9 pan, and then topped it off with the cheese and crumbs. Then bake at 375 for a bit longer than I did - I probably baked it twenty-five minutes, but we were hungry and impatient. Forty minutes would probably be perfect. It was SO wonderfully fragrant with the fresh herbs and garlic. Next time I think I would do the same thing, but with Italian sausage instead of the browned beef. This evening I was speaking to a good friend who LIVED IN JAPAN for about six months, and was surprised that she had never made or heard of Nasi Goreng. 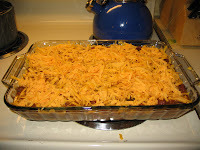 We were first introduced to this wonderful, economical dish by friends in South Carolina. They had been raised in the Dutch Reform community in Canada, and therefore had deep cultural ties with the Indonesian culture, and had been raised eating Nasi Goreng. Like most fried rice dishes, this one is very flexible, and a great way to use up the bits of this and that in your refrigerator. You need already cooked cold rice to make this dish - so make this the day after you have Chinese take-out to use up that last big container of white rice. Chop an onion or two, and sautee until translucent, and then add some chopped garlic. Meanwhile, crack and beat a few eggs. Add the eggs to the pan, and scramble them so they are in little bits. Add in the (already cooked) bits of meat or seafood, mix it all in and let it sit for a few minutes. Serve with sweet soy sauce on top. YUMMY! 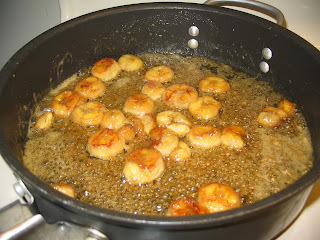 sweet soy sauce really makes this dish - and is also a quick addition to many other asian or pan-asian dishes. The bottle you see to the right is the one I buy. I find it at a Vietnamese run store in Philadelphia - but I was also able to find it when I lived in South Carolina. If you can't find it nearby, you can always order it online. 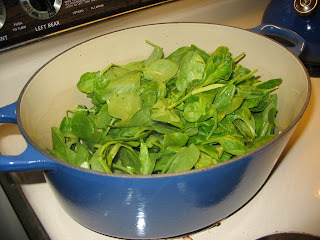 Set aside the surprisingly small quantity of spinach which results. In the same pan, sautee the onion, and when that is almost cooked (translucent) add the chopped pepper and garlic. 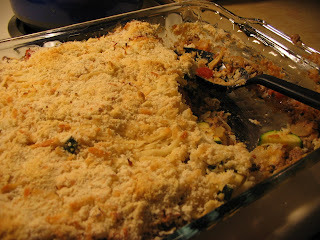 Once the vegetables are soft, turn the heat down to medium, and add the cream cheese. WATCH THIS CAREFULLY, stirring frequently until completely melted. 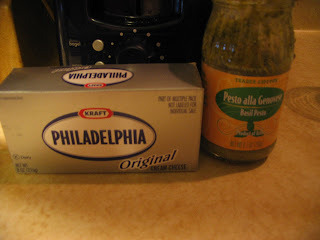 Add a few tablespoons of pesto, and some romano cheese. 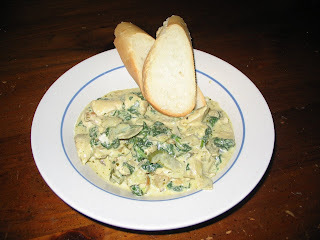 Stir the wilted spinach back in, as well as the artichoke hearts. Turn to low, stirring occasionally. Meanwhile, cut the boneless chicken breast into quarter size pieces. Cook in a separate pan in a bit of olive oil. Add salt and pepper. Once the chicken is cooked, pour the contents of the pan into the vegetable mixture, including the (cooked) juice from the chicken. 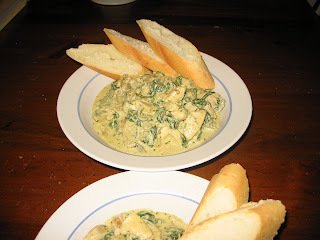 Serve with french bread to be able to eat all the yummy sauce! The Southern Resident specifically told me to tell all of you that this was VERY good - that's a first! 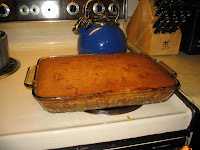 This is a slight variation on a wonderful recipe from a friend in South Carolina. You can do so many things with a salad. This one turned out pretty well, so I thought I would share it. 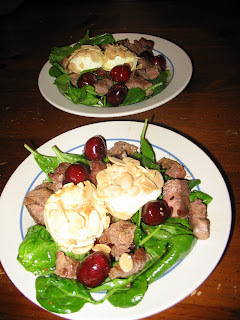 Baked Goat Cheese Medallions: I cut the Chevre into 8 equal slices. I dipped each into an egg wash (one beaten egg with a splash of water), and then placed the cheese into a bowl of toasted almond slices. 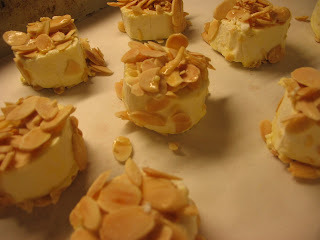 I used my fingers to make sure each piece was fully topped with almonds. I then placed these in a baking pan (which I lined with parchment paper for easy clean-up). These I baked for about ten minutes at 400 degrees. I washed and pitted the cherries. 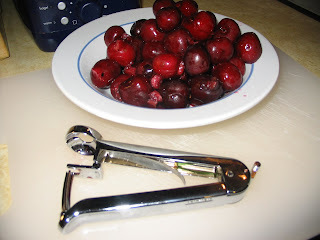 A little trick I've found is to use the cherry pitter right down in the colander. The pits stay put for easy disposal, and MOST of the juice shoots into the colader. But don't wear your favorite white shirt for this task anyway. Meanwhile, I started the grill and seasoned the steaks. I grilled them on high heat, about 2.5 minutes per side. To make a simple vinaigrette I used whole grain mustard, walnut oil (happened to have it on hand), and rice wine vinegar. I mixed this into washed spinach leaves, and sprinkled in salt and pepper. Then I mixed in the cherries. 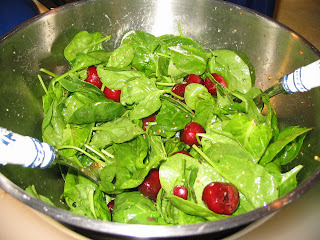 Assembly: scoop spinach/cherry mixture into a bowl. 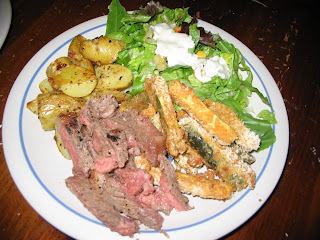 Top with two medallions of warm goat cheese and bite sized pieces of steak!